Go ahead, ask us anything. Whether you’re interested in becoming a member or you’re already a member, here’s where you’ll find answers to some of the most popular questions we hear every day at Grow. So ask away. And if you don’t find what you need here, you can always call us at 800.839.6328. There are many ways you can qualify to become a member with Grow! A few of the most common ways include being active or retired military, currently working for one of our Select Employee Groups or as MacDill Air Force Base Civilian Personnel, and if you have an immediate family member or live in the same house who qualifies for membership or is currently a member! If none of these apply, click here to see other ways you may qualify and to begin the account opening process! How Can I Make My Loan Payment? How Can I Make A Check Deposit? Our Grow mobile banking app services allow you to take a picture of the front and back of your check. Once logged into the app, select Deposit Check and follow the prompts to ensure speedy processing. If you have a Grow Visa® debit card, you are able to deposit into any of our deposit taking ATMs. ATMs in your area can be found by typing in your zip code in the Locate option on our website. To make a deposit in person, please visit one of our stores located in West Central Florida and South Carolina. To find the store nearest you, type in your zip code in the Locate option on our website. You may mail your check deposits to: Grow Financial Federal Credit Union, P.O. Box 10006, Irmo, SC, 29063-5006. For your security, please do not mail cash. What Is Grow's Routing Number and My Full Checking Account Number? Grow’s routing number is 263182914. 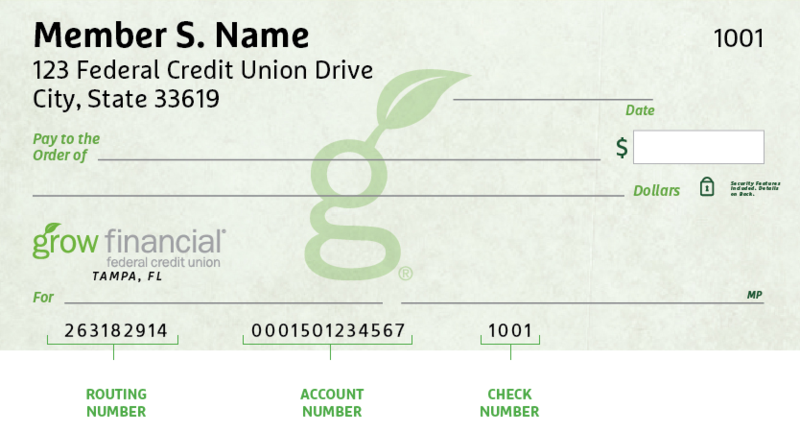 On your checks, you can find your full account number in between the routing and check number. If you don’t have checks, visit your local Grow store location and pick up a Direct Deposit Letter. How Can I Apply For A Loan or Credit Card? We give you a variety of convenient options to apply of a loan or one of our Grow Visa® credit cards online, in person, or by phone. Apply for a loan here or a Grow Visa credit card here or apply within Online Banking. Please visit one of our stores located in West Central Florida and South Carolina. To find the store nearest you, type in your zip code in the Locate option on our website. Our Member Contact Center will be happy to assist you Monday through Friday 7 am to 7 pm at 800.839.6328. How Do I Let Grow Know That I Am Travelling? Travel notifications are no longer needed with the new Grow CardManager App. When the Mobile Location Confirmation is turned on while traveling, Visa is aware when you are traveling to avoid disruptions in service. If you are not a smart phone user, please call our Member Contact Center at 800.839.6328 to inform us of travel plans. What Can I Do To Better Protect Myself Before Making A Purchase? When you’re making a purchase, be aware of all the merchant’s terms, guarantees and warranties, as well as language like “all sales are final,” as they may limit your ability to make returns or dispute a transaction. For additional helpful hints to consider before you make a purchase, please visit usa.gov/before-you-shop. How Do I Report Fraudulent Activity On My Account? To report a fraudulent transaction, please visit one of our stores, or contact our Member Contact Center at 800.839.6328. The easiest way to dispute a charge on your account is to submit the filled-out Dispute form and return it back to us. You may drop the form off at the any store location or email it to member.service@growfinancial.org. I Lost My Card/My Card Was Stolen, What Do I Do? Once you realize your card is lost/stolen, please immediately call us at 800.839.6328. By immediately notifying us, we can close your card and ensure a new one is issued to you! I Have A Transaction On My Account I Did Not Authorize. We are here to help! First, have you done business with this company before? If so, we ask that you please reach out to the merchant that charged your account and attempt to resolve with them. If they are unwilling or unable to help you, you may visit any of our stores or contact us at 800.839.6328 to request a dispute. If you have never done business with the merchant, we will help you with submitting a claim and provide you with information you need to know.